This procedure uses a gel-bleaching agent that contains 35% hydrogen peroxide. This can only be applied by a dentist as great care must be taken in apply a high concentration of bleaching agent. Before bleaching a proper assessment must be made of the teeth to ensure there is no decay or gum disease present. Also to determine whether there are fillings, veneers, crowns or implants or exposed root surfaces or dentine (the next layer of tooth) in the bleaching area. Proper cleaning habits must be established before bleaching is carried out. Bleach will work on healthy enamel only. Decay weakens the enamel and exposes the next layer of the tooth- the dentine. Bleaching will cause sensitivity on any exposed dentine or root surface. Bleeding gums make it difficult to apply the bleach to the enamel and potentially stain the tooth as the blood can be absorbed into the bleached enamel more easily. Tooth coloured fillings, when bleached, can be damaged or ruined. Crowns and bridges and veneers cannot be bleached. Implants surfaces can be damaged by the hydrogen peroxide, potentially causing the loss of the implant. Proper cleaning that ensures the surface is clean and the gums are healthy is important. Equally not over brushing will ensure the roots are not exposed and the bleached enamel is not worn away. Why spend the money and watch it disappear! The teeth are firstly cleaned to removed any bacteria and stains. Bleach will irritate the gums and other soft tissue, such as the lips and tongue, and cause sensitivity in any exposed dentine. We use a lip guard that covers the lips and pulls it away for the teeth to be bleached. A runny tooth coloured material is placed on gums around the neck of the teeth, on any exposed dentine, and on any fillings , implants or veneers. Then a light is used to set the material. 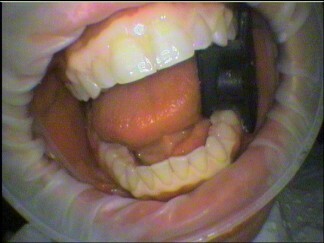 A mouth prop is used to keep the mouth open and allow the patient rest the jaw. 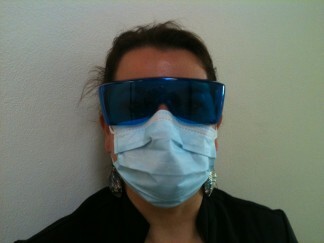 The patient, the dentist and the nurse wear special protective blue glasses. 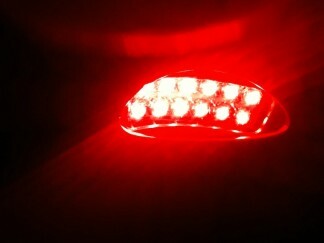 The light is extremely bright and can damage the eyes. Bicarbonate soda is mixed and is on standby so as to neutralise any bleach that may run onto any unprotected gums. 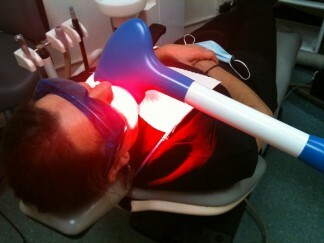 The bleach gel is applied on usually the six top and bottom teeth and a special very bright light for eight minutes is shone onto the bleach. This helps to activate the bleaching process. Usually the bleach is removed carefully leaving the protective material guards, before applying a further two more applications of eight minutes each. Once completed the bleach is rinsed off thoroughly, then all the protective layers are removed. Please note – the degree of lightening of the teeth cannot be determined before the treatment is completed. The bleached effect does fade over time and may need further bleaching. Warning – For 48 hours avoid red or brown coloured drinks, foods ,sauces such as coffee, tomato sauce, beetroot, gravy, and red wine. This can stain the teeth as the colouring can be absorbed into the bleached enamel. Do not smoke for 48 hours – this can stain the teeth and can heighten sensitivity in the bleached teeth. Next week: All you ever wanted to know about health funds but were afraid to ask – The items numbers – Part 1.